Despite the fact of the recent technical development of scientific laboratories, the Neubauer chamber remains the most common method used for cell counting around the world. This technical data sheet has been composed in order to help experienced, as well as non-experienced, researchers perform a proper cell counting using a Neubauer chamber or Hemocytometer. The principles described in this technical data sheet apply to any cell counting chamber, although the dimensions and volumes of each chamber may differ. The technical data sheet describes the best practices, applications, and recommendations when performing a cell count. The Neubauer chamber is a thick crystal slide with the size of a glass slide (30 x 70 mm and 4 mm thickness). In a simple counting chamber, the central area is where the cell counts are performed. The chamber has three parts: (1) the central part, where the counting grid has been set on the glass, and (2) double chambers/two counting areas that can be loaded independently. 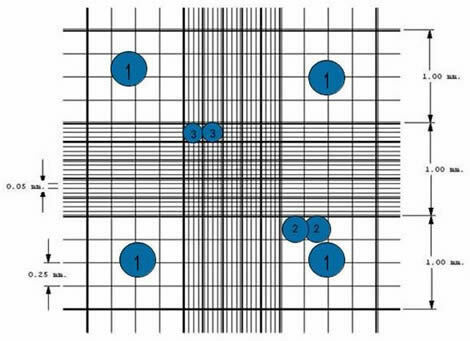 Neubauer chamber's counting grid is 3 mm x 3 mm in size. The grid has 9 square subdivisions of width 1mm (See Fig. 4-1). In case of blood cell counting, the squares placed at the corners are used for white cell counting. Since their concentration is lower than red blood cells a larger area is required to perform the cell count. The central square is used for platelets and red cells. This square is split in 25 squares of width 0.2 mm (200 µm). See Fig. 4-2. Each one of the 25 central squares is subdivided in 16 small squares. Fig 4-3. Therefore, the central square is made of 400 small squares. The glass cover is a squared glass of width 22 mm. The glass cover is placed on the top of the Neubauer chamber, covering the central area. The glass cover leaves room for the cell concentration between the bottom of the chamber and the cover itself. The chamber is designed so that the distance between the bottom of the chamber and the cover is 0.1 mm. It is not uncommon that the glass cover remains slightly lifted when we introduce more liquid than necessary in the chamber. To avoid this, some counting chambers have two special clamps to avoid the cover glass to avoid edge-lift. If the glass cover is lifted, the distance between the chamber and the cover will be higher than 0.1 mm, and the cell counts will not be accurate. The pipette allows for the introduction of a precise amount of liquid into the Neubauer chamber. Historically, they have been manufactured in glass. Nowadays, glass pipettes have been replaced by micropipettes, than can be calibrated with a maximum capacity of 20,200 and 2,000 µl. Depending on the type of sample, a preparation of a dilution with a suitable concentration should be prepared for cell counting. Typically, the concentration range for a cell count with Neubauer chamber is between 250.1 cells / ml and 2.5 million cells / ml. It is recommended for the dilution concentration to be around 106 cells / ml (1 million cells / ml) applying the required dilutions. With concentrations below 250,000 cells per ml, (2.5 x 105 cells / ml) the amount of cells counted will not be enough to obtain a fair estimation of the original concentration. Above 2.5 million cells / ml (2.5 x 106), the probability of counting errors increases as well as the time and effort required to achieve a reliable cell count. Above 2.5 million, it is preferable to dilute the sample to obtain a final concentration closer to the optimum 1 million per ml. It is important to write down the dilution performed to the original sample. Take 10 µl of dilution prepared in step 1 with the micropipette. Put the glass cover on the Neubauer chamber central area. Use a flat surface to place the chamber such as a table or workbench. Put a disposable tip at the end of the micropipette. Adjust the micropipette to draw 10 µl. You can adjust it by turning the upper plunger roulette to select the required pipetting volume. Introduce the micropipette tip on the dilution previously prepared in step 1. Push the pipette plunger slowly until you feel it has arrived to the end of its travel. Place the pipette tip close to the glass cover edge, right at the center of the Neubauer chamber. Release the plunger slowly, watching how the liquid enters the chamber uniformly, being absorbed by capillarity. See Figure 5. In case of the appearance of bubbles or that the glass cover has moved, repeat the operation. The Neubauer chamber has been loaded, and is ready to perform the cell count! Place the Neubauer chamber on the microscope stage. If the microscope has a fixing clamp, fix the Neubauer chamber. Turn on the microscope light. Focus the microscope until you can see a sharp image of the cells looking through the eyepiece and adjusting the stage. Look for the first counting grid square where the cell count will start. In this example, 5 big squares from a Neubauer-improved chamber will be counted. See Figure 6. Start counting the cells in the first square. Different laboratories have different counting protocols, however, there is a popular unwritten rule that states: "Cells touching the upper and left limits should be counted, unlike cells touching the lower and right limits, which should not be taken into account." In case of high cell concentration, it will become very easy to get lost when counting cells. In this case, a counting technique in zig-zag is used. See Figure 7. Write down the amount of cells counted in the first square. Repeat the process for the remaining squares, writing down the counting results from all of them. The higher the number of cells counted, the higher the accuracy of the measurement. The number of cells will be the sum of all the counted cells in all squares counted. 0.1 cm x 0.1 cm = 0.01 cm2 of area counted. In the case that a dilution was applied, the concentration obtained should be converted to the original concentration before the dilution. Errors in the range of 20-30% are common in this method due to pipetting errors, statistical errors, chamber volume errors, and errors from volume of sample introduced into the chamber. Regardless, the Neubauer chamber remains the most widely used cell counting method in the world.